The Trees for Mum program started in 2002 as a relatively small event celebrating the legacy of motherhood. Now, ten years later, it has grown into a national occasion where participants around Australia plant a tree on Mother's Day in honour of their mum and the beauty of life. Through a partnership with Landcare Australia, Trees for Mum is a nationally recognised Mothers Day event. 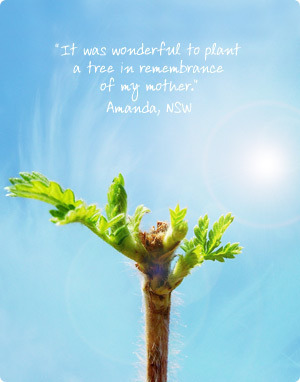 When Lauren Adlam and Deena Raphael brough Trees for Mum to life in May 2002, both women had lost their mothers to cancer and were interested in doing something for other people who do not have mothers to celebrate the day with. A symbol of new life, planting a tree is a poignant nod to mothers everywhere. Manly Council in Sydney first supported the event and attracted over 150 people to Manly Lagoon Park to start the planting. The following years, the program saw wider participation from councils across Sydney and has since expanded around Australia. After eight years of tirelessly working to bring Trees for Mum to life and with Deena now living in America and Lauren juggling kids, running a household and working, it's only fair that someone else takes on the responsibility for organising future events. Since 2010, Alecia Braven has kindly offered to do this, ensuring that the event continues. Ironically Alecia attended the first tree planting back in Manly in 2002 and planted the last tree on the day with Lauren and Deena. Alecia's mum also died of cancer at the young age of 40. Alecia brings renewed passion and enthusiasm which will take the event to new heights, reaching even more people in the community. To date more than 20,000 people have participated in the Trees for Mum Mother's Day program at over 100 planting sites across Australia. People of all ages, especially children are encouraged to get involved and plant a tree for mum this Mother's Day. Planting a tree is a lovely activity and a great experience to share with family and friends, and also a beautiful homage to those whose mother's have passed on. You can attend one of our organised Trees for Mum planting sites located in your area or don't be afraid to organiser your own event. All you need to do is contact the foundation and receive a Project Kit to get you started.